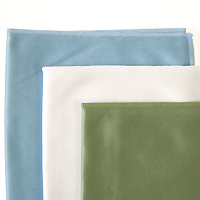 Which Microfiber Cloth Should I Choose? Often times you hear about how wonderful a microfiber cloth is but seldom do you know exactly what to use it on/for. You'll find that the biggest key factor when choosing a cloth is the "lint" level of the material. Cloths that are tightly woven or looped woven, normally are a low lint cloth. These are ideal for screen cleaning, or delicate surface cleaning. Cloths that have cut fibers instead of loops tend to be quite linty as they are sheered at the ends. This material is best used on general surfaces such a counter tops, equipment polishing, dusting and so on. Below is a table that will hopefully help clarify the difference between the different weaves and textures. Silky Textures Silky, Smooth, Fine Very low lint. Loop, tight weave Lenses, Large & Small Screens, Glass, Jewelry, CD's, DVD's, etc. Suede Textures Suede like, Soft, Thick Low lint. Better after one wash Critical screen cleaning, Cameras, Glass, GPS's, etc. Pattern Textures Depends on the material: some are the silky or more of thick cloth like the suede Very little to very low lint with most Cloths with a pattern (ex: our "Bubble" Microfiber Cloth #355) usually have a better ability to scoop up dust and debris since they have a "groove" to lock the particles in to. One of the coolest characteristics about the microfiber cloth is that you can clean a smudgy/dirty surface with your cloth dampened by only water! And they're so eco friendly because they're washable! Cutting down on waste, helping you to help save the planet! 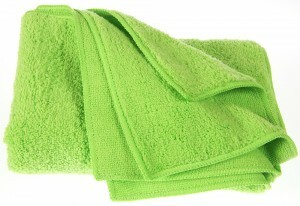 We do offer many different microfiber cloths, but it's up to you in which you like best. If you still don't know which cloth type to order, feel free to contact us! This entry was posted in Microfiber Cloths and tagged Cleaners, Cleaning, Environment, Green, Lens, Microfiber Cloths.